:: FIRST WORDS : Westward Ho! On December 14, 2006, meteorologist Nick Allard ’03 wrapped up his morning shift at the Northwest Cable News station in Seattle. Since a major wind storm was headed for the coast, he checked into a nearby hotel, rested for a few hours, and then headed right back to work. The severe weather had been building over the Pacific Ocean for a few days. As it closed in on Washington it was growing more intense. A long front reaching all the way up to Vancouver Island ran up against the coast and the Olympic Mountains. Every person has experienced a weather event that sticks with him for the rest of his life. For Allard and thousands of other Washingtonians, this storm would be it. The previous month had soaked the region with 16 inches of rain and delivered plenty to report about thanks to a series of Pineapple Express storms carrying moisture from near Hawaii. That November had already broken precipitation records, flooded rivers, and caused dangerous mudslides. Typically, when storms hit our coast they are weakening and falling apart. Some come from the southwest, then suddenly turn north and head for the Gulf of Alaska, danger diverted. But when the December 2006 storm hit land, it came in from almost due west. Low, cold, unstable air moved over Vancouver Island, and around midnight something the experts poetically call “the poisonous tail of the bent-back occlusion” wrapped a tail of high pressure and strong winds down and west over Washington. Winds ranging from 90 mph on the coast to 70 around Seattle raked over the region, plucking trees and power poles from the sodden ground. More than a million residents lost electricity, several lost their lives, and within days the region was declared in a state of emergency. Later, scientists noted that it was the second worst storm to batter Washington in 50 years (after the devastating Columbus Day Storm in 1962, which took 40 lives). Washington has some of the heaviest snowfalls, most catastrophic flooding, and the most intense non-tropical storms in the country. Adding to the unpredictability are the microclimates and surprising weather contrasts. For example, while the Olympic Coast is doused with rain up to 130 inches a year, just a few miles away the town of Sequim averages a mere 15 inches. On the other hand, everyone knows the Northwest for its temperate climate. The soft rain, the cool summers, the gentle winters. Even Eastern Washington, which has its share of freezes and snows, is still quite sheltered from the coldest Canadian arctic air by the Rocky Mountains. Montana and the Dakotas aren’t as lucky. But in all this mildness, there lurks a dark, unpredictable side, says Allard. While the Pacific Ocean is really the star force in our weather, the mountain ranges are actors in creating a number of other microclimates, including the Puget Sound convergence zone, where air flow from the Pacific Ocean is divided around the Olympics but then corralled by the Cascades. When the two fronts of the same flow meet over Puget Sound, air rises and forms a band of clouds and precipitation, usually in an area between Seattle and Everett. While it could be sunny in Seattle and Mount Vernon, it may be pouring in Mill Creek. And while our mountains often protect us from the deepest cold, we have some major vulnerabilities including the Fraser Gap, which channels arctic air down the Fraser River and into Bellingham, and the Columbia River Gorge, which shoots cold air west from Eastern Washington. And sometimes the Canadian Rockies can’t hold back the cold arctic surges, which can drop our winter temperatures well below freezing. It’s Brad Colman’s job as meteorologist-in-charge of the National Weather Service’s Seattle Weather Forecast Office to keep track of all of the weather. He found the Hannukah Eve Storm of 2006 particularly memorable. “A tree fell on my house,” he says. 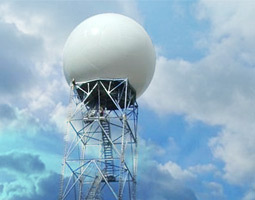 When Colman came to Seattle to work for the National Weather Service 20 years ago, much of the weather data was provided by air traffic radar. It wasn’t that helpful, he says, since it was designed to see through clouds and precipitation to capture airplanes. Back then it was even more difficult to watch the storms coming in off the Pacific, or to predict the cold fronts issuing from British Columbia. Since then more than 120 Doppler stations, as well as other weather measuring equipment, have gone in around Washington and the rest of the country. “It was an amazing improvement,” says Colman. Now there are more hits than misses, thanks to a number of tools including satellite images and numerical models that help the scientists look up to 15 days into the future. “That’s when we first see a storm,” says Colman. “At that point it doesn’t exist on the earth. It only exists in our models.” The beginnings of our storms can happen on the other side of the Pacific Ocean. “Observations made in China will provide information long before it shows up on our radar,” he says. This September, a new coastal Doppler radar station will be up and running near Copalis Beach. It solves a key problem, that of the existing Camano Island station’s limited view over the Olympics. It will let us see below 25,000 feet and better look into approaching storms to determine their intensity. The new station won’t necessarily help predict the storms, since it can only see out a few hundred miles. “But we will see a lot more of what’s going on,” says Colman. It also provides some lead time with flooding because the station will be able to capture more details about the type and amount of precipitation. “It will improve the quality of our rainfall estimates a great deal,” says Colman. That in turn will give the Weather Service, depending on which river systems get the rain, six to 36 hours to prepare and provide flood warnings, helping forecasters like Allard do their jobs. “I’m often more amazed about what we do know is out there than what we don’t know,” says Colman. The new Doppler radar, which will help us look 250 nautical miles out to sea, is one thing. But for more immediate information, the meterologists make use of WSU’s AgWeatherNet, a tool that gives raw data about wind, temperature, and rainfall from 130 sites around the state. The measurements are made from tiny weather stations set up in every county, from Asotin to Whatcom, with many of the sites along the Columbia and Yakima river basins. For good reason. The first stations were installed in 1989 in places like Touchet, Quincy, and Basin City to provide support for tree fruit growers, says Gerrit Hoogenboom, agrometeorologist and director of AgWeatherNet. While we’re talking, Hoogenboom pulls up the AgWeatherNet website. “There are 60 people looking at it right now,” he says. It’s fairly early in the morning and the fruit trees are blooming. The users are likely checking for frost and wind information, he says. The stations are networked through radio telemetry to a WSU server and the data are updated every 15 minutes. With so many high value crops like apples, cherries, and pears, a few minutes of warning can offer enough time to turn on irrigation systems or wind machines to protect the fragile buds from frost. In some areas along the Columbia Basin, the number of weather stations is quite concentrated—it’s because of the variation in the landscape, says Hoogenboom. Ideally, he adds, there would be one every square mile. Providing the high quality data has its challenges. WSU must maintain and recalibrate the stations. With so many throughout the state, that takes a lot of work. But the system is useful beyond treefruit needs, notes Hoogenboom. The data can be used by researchers and natural resource workers, it can help farmers make decisions about managing their fields, and teachers can access it for their classes. “This is not only for agriculture,” Hoogenboom says. “It has a whole range of different applications—science in the classroom, water management, energy management.” The National Weather Service, particularly the Spokane office, makes frequent use of the stations’ data. While our weather forecasters watch the sky and the sea to help us prepare for the coming week, a whole cadre of experts, including more than a dozen at WSU including engineers, agronomists, and evironmental scientists, are peering ahead up to 100 years to see how the climate in Washington may be changing. Brian Lamb’s expertise in air quality makes it no surprise that his most memorable weather event in Washington was the 1980 eruption of Mount St. Helens. “It’s not quite a weather event,” admits the director of the WSU Center for Environmental Research, Education, and Outreach. But weather played a part. Winds blowing east carried ash 300 miles to the Palouse where it grew so dark “the street lights went on in Pullman at 3 p.m.” While most people remember the blackout and falling ash, that layer of ash cloud prevented the areas it covered from warming during the days and cooling at night. 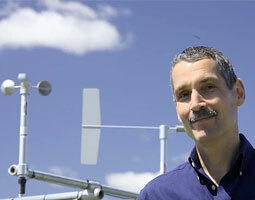 Because of his expertise with measuring air particulates, Lamb works closely with hydrologists, meteorologists, and atmospheric scientists including Cliff Mass, author of The Weather of the Pacific Northwest and professor at the University of Washington, on a wide range of studies involving the weather, climate, and global warming due to human activities. 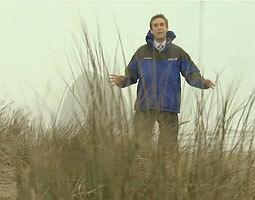 When it comes to expertise in Northwest weather, “he’s the guy,” says Lamb. According to Mass, with climate change “things are going to vary a lot around the world.” But warming in the Pacific Northwest will probably be slower and less. “Our weather is dominated by the Pacific,” he recently told a crowd in Port Townsend. “We are downstream of an area that is warming up more slowly than most places.” Between the 1990s and the 2020s, Mass sees no great difference. By the 2050s, he expects average temperatures to rise three to four degrees. By the 2090s, it should be up eight to 10 degrees in places like central Washington. “This is a different world,” he said. The scariest change in Mass’s forcasts is in snowpack. “We’re not going to have less precipitation,” he says. “We’re going to have less snow,” which means less snow melt for hydropower, consumption, and irrigation. Not only does Lamb work with Mass and others to look at what the weather is doing (Is there rainfall? Which way and how forcefully is the wind blowing?) he is concerned with the particulates carried or not carried around on Northwest air currents. “You not only have to get the weather right, you have to deal with the sources of pollution,” he says. Those include traffic, the oil refineries north of Seattle, and agriculture in Eastern Washington, to name a few. “All those have to be captured at some level of detail in order to get things right,” he says. Lamb is not as concerned with major storm events as the lack of weather—those still periods when air contaminants, particularly ozone, can build up. The study of air quality in the United States really started back in the 1950s and ’60s, when Arie Haagen-Smit, a chemistry professor at Caltech, linked the Los Angeles smog problem to automobile emissions. It was at Caltech in the 1970s that Lamb developed his expertise in measuring air quality. “When I came to WSU, there was already a very active air pollution group,” he says. It had started in the late 1940s and early 1950s in response to air pollution associated with aluminum smelters in the Northwest. By the time Lamb arrived, though, the program was focused on field studies in the southern and eastern United States, areas with higher populations and major air quality issues. But ozone isn’t the only issue in the state. Eastern Washington has concerns with particulates from dust and pollutants, and Tacoma is running into problems with very fine particulates from both industry and wood-burning in the atmosphere. “They get very stable inversions in the winter time,” says Lamb. That limited air movement, the cold, and the burning of wood stoves make for a high level of these small particles that can aggravate heart and lung diseases. As part of a multi-university effort, Lamb; Claudio Stöckle, chair of WSU Department of Biological Systems Engineering; Chad Kruger, director of the WSU Center for Sustaining Agriculture and Natural Resources; and several other WSU scientists are members of REACCH (Regional Approaches to Climate Change). The $20 million USDA-funded project involves scientists from the University of Idaho, Oregon State, and WSU. Together, they are trying to help farmers adapt their agricultural practices to suit the changing climate and to perhaps practice farming in ways that can reduce greenhouse gas emissions and make more efficient use of fertilizer and fuel. But over the long term we will see warmer temperatures, changes in precipitation patterns, shorter snow seasons, and earlier spring melts. “It will have an impact on ski resorts, ag producers, power generation, and stormwater runoff in urban areas,” Lamb says. “In terms of air quality, the modeling we’ve done so far doesn’t show a really large climate effect on air quality in the Northwest.” It does in other parts of the country, though. In places with big ozone problems, including the eastern half of the country, there will be more stagnant air episodes. But since our weather is driven by the Pacific Ocean, “here in the Northwest, we should be concerned with what happens in Asia,” he says. As difficult and demanding as it is to peer out over the ocean and up into Canada to predict what the weather is going to be, predicting the changes in climate and figuring out how to prepare is far more challenging. 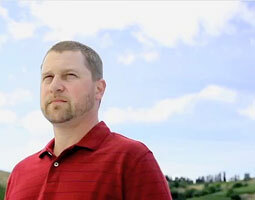 One recent effort to do so came in 2009 when Claudio Stöckle and a team published Assessment of Climate Change Impact on Eastern Washington Agriculture. Assuming irrigation continues, the report found that impact on apples, potatoes, and wheat will be mild for the next two decades, but could cause up to 25 percent in yield losses by the end of the century. A multitude of climate change projects are now in the hands of WSU scientists. One afternoon this spring Chad Kruger stepped out of a room on the Pullman campus where he had spent the day discussing climate modeling efforts with more than a dozen other scientists. The BioEarth project is mostly about models that will help us look into the next few decades. Led by Jennifer Adam, an assistant professor in WSU’s Department of Civil Engineering, the team is using the Pacific Northwest to study how nitrogen, carbon, and water interact to make regional aquatic, terrestrial, and atmospheric models that will help governments and decision makers better manage our agricultural and natural resources. Because the Northwest is a complex place with extensive agricultural lands, pristine wildlands, and heavily populated urban areas, it is a good location for developing a state-of-science regional modeling system. “We’re trying to incorporate human management into the modeling,” says Kruger. Projecting 20, 30, even 60 years into the future, the group is defining agro-ecological zones and projecting what these zones might need. In some cases, when the climate gets two to three degrees warmer, seasons will start earlier and water will become scarcer. Issues of diseases, pests, and weeds will change. The modeling will help the scientists and the farmers understand what’s coming and how they might adapt their behaviors, says Kruger. Kahlotus farmer Jim Moore ’60 grows wheat in an area of low precipitation. It’s an area that studies predict will grow warmer and see less precipitation in the next 20 to 40 years. Moore says the winters now are much milder than when he was a child. Back then they farmed in a way that captured moisture from the heavy snows. Moore knows that major weather events can stick with you all your life. He remembers the winter of 1949–1950 when it dropped to 20 below and stayed that way for several weeks. The Palouse Falls froze. For the Moore family, the big challenge was getting water from the well to the cistern. The buried pipe froze solid, leaving the family and livestock without water until a neighbor used a big electric welder to heat the pipe with an electric current. For Moore, then a teen, the flooding was more fascinating than fearsome. “We had a lot of fun with it as kids. We’d float two-by-fours in the running water.” Still, he’d be happy never to see another season like it. “That’s the worst winter I can remember,” he says. The most memorable Washington weather WSU soil scientist Craig Cogger ever experienced was in 2009. The temperatures in Western Washington broke all-time record highs by two or three degrees. At the research station in Puyallup, the heat reached 102 degrees. At the airport it peaked at 106, and some areas saw 108. “It was much warmer here than it was over in Eastern Washington,” he says. “I’m not a meteorologist, but I am a weather junkie,” Cogger says. He checks his computer several times a day to see the National Weather Service forecasts. “But what I really like is the forecast discussion,” he says. There, using scientific terms, the meteorologists talk about why they made the forecasts that they did. What he learned prompted him as a scientist and extension agent to reach out to his community to explain how and why climate is changing and to urge people to be more concerned and involved. He gives the talk to church congregations, Kiwanis groups, Master Gardeners, and professional audiences. Move cursor left or right over timeline (below) to control. Move off top or bottom to stop.